Celebrate the adoption of your new pup with a rescue shower. 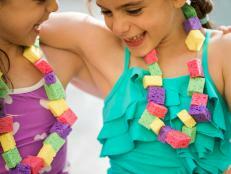 It's the perfect way to introduce your new four-legged kid to friends and family. What's a Rescue Dog Shower? 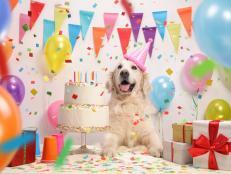 Send your friends and family custom invitations showing off your new furbaby. 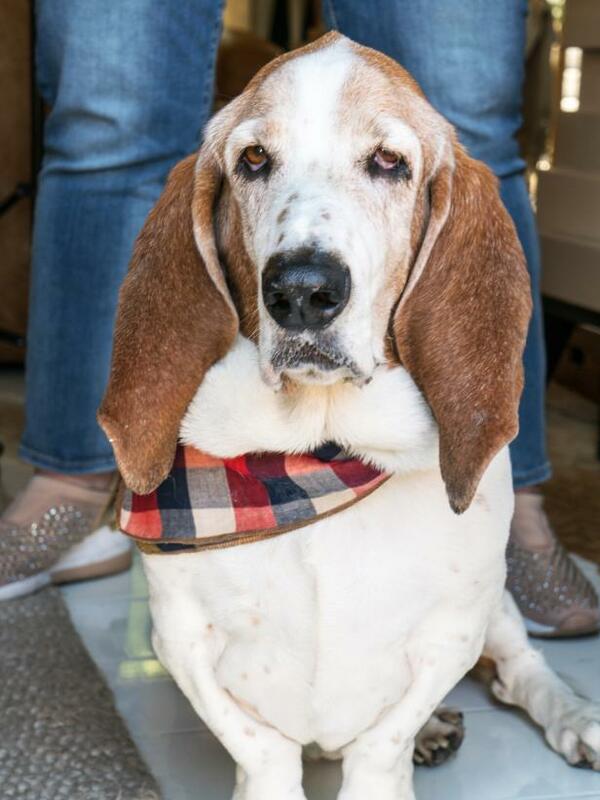 This is Gus, a 9-year-old senior Basset Hound who we adopted from Basset Hound Rescue of Southern California. 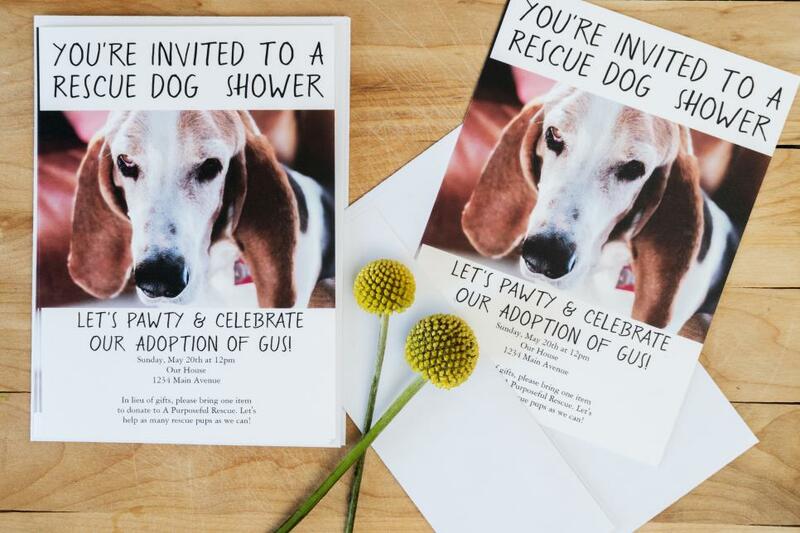 Tell your guests on the invite that your shower will be used as a fundraiser and that instead of gifts for your new dog, you would prefer donations for the rescue group. 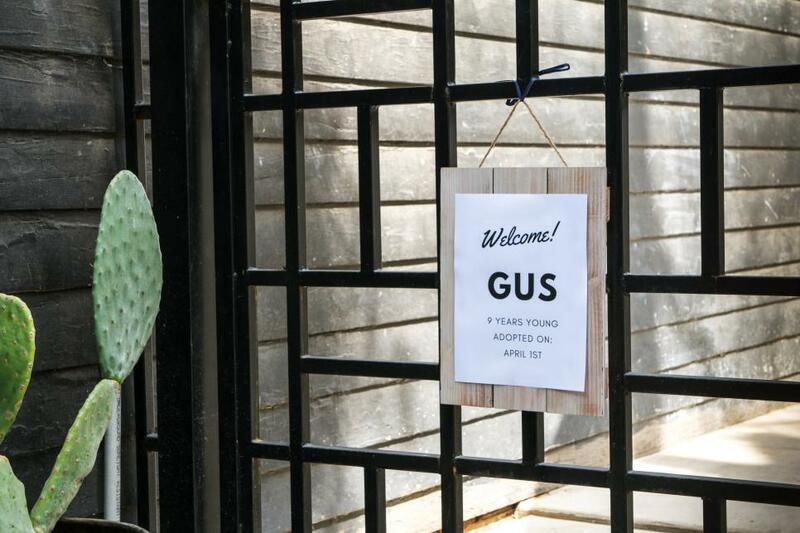 Let everyone know they're in the right place with a simple party sign like this one. 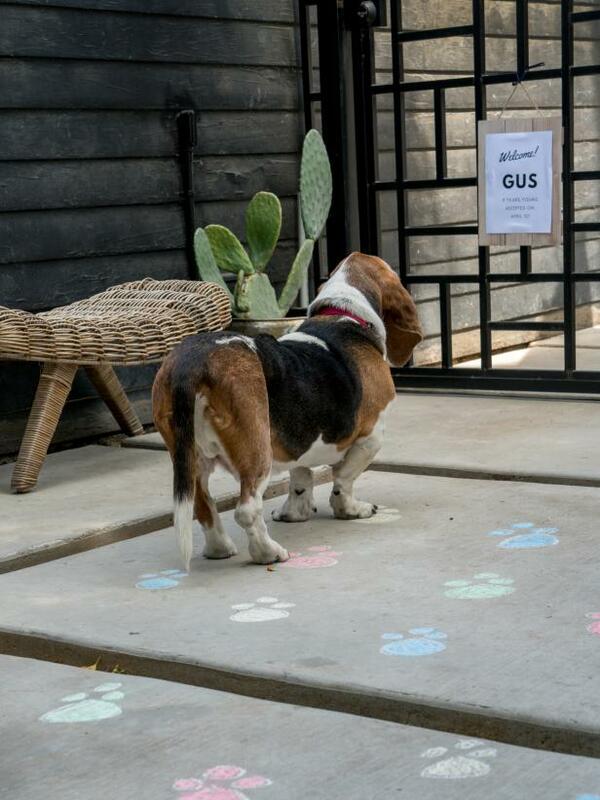 Ours says: "Welcome Gus! 9 years young, adopted on April 1." 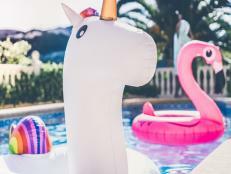 Canva is a great (and free!) site to use for making fun signs and simple graphics. Use chalk to draw paw prints on the ground in front of your house, leading your guests to the party. We gave Gus a spiffy bandana to wear on the day of his party. With a special place in our hearts for the old guys and gals, my husband and I have decided that we would only adopt senior Bassets. Gus is our third senior guy, and we couldn't be more excited to have him as a new member of our family so we can give him the posh retirement he deserves. 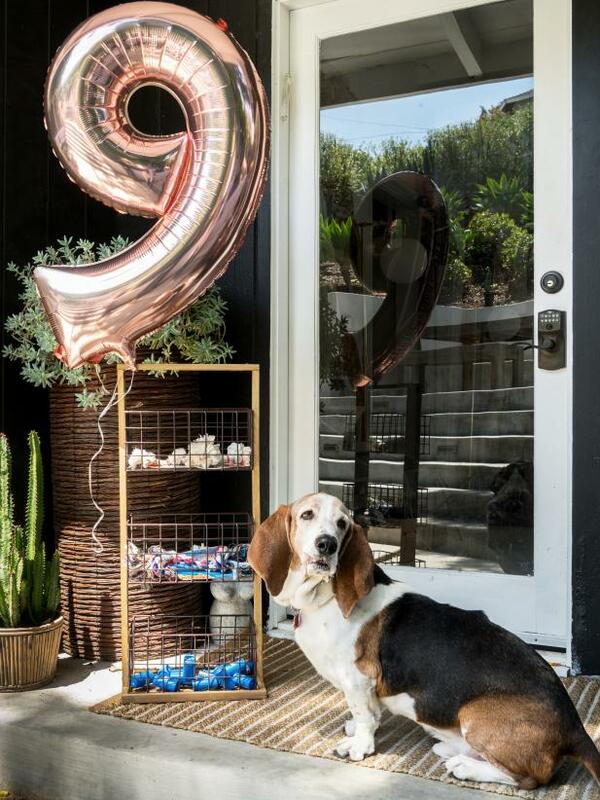 Gus got a big number nine balloon to celebrate his Gotcha Day. Since you often don't know your adopted pet's actual birthday, it's fun use the day you adopt your dog as their birthday or Gotcha Day. 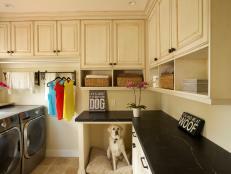 Use a simple bathroom storage tower to keep dog supplies, such as toys and waste bags, at the ready for all your four-legged guests. 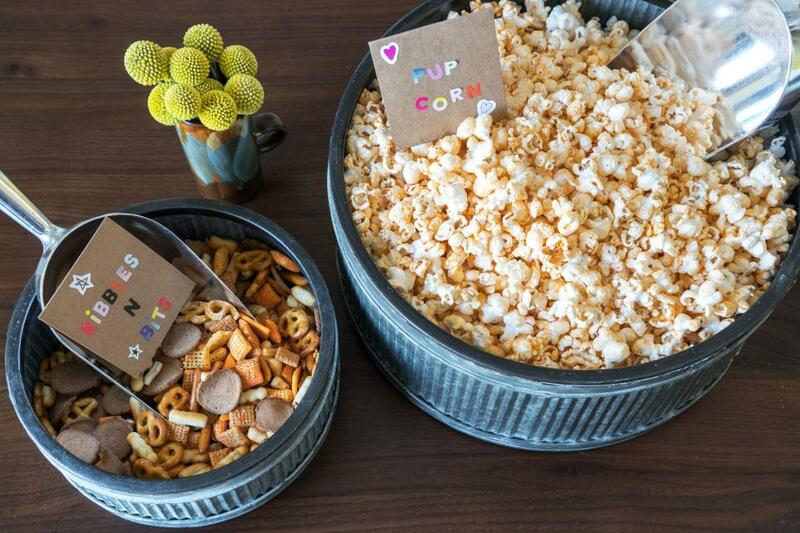 You'll want to set up some snacks for your guests. Think of snacks that are easy to carry and eat, as the pups will require a lot of attention. We put out some popcorn (or pupcorn) and some snack mix (or Kibbles 'n Bits). Use small cups or scoops so everyone can serve themselves. We also chose serving bowls that look like dog bowls. We used a fruit basket to hold shower necessities, like tennis balls and waste bags. Keep these supplies in a central location so anyone can easily grab whatever they need. It can sometimes get chaotic when you bring a bunch of dogs together, so be on alert to avoid any skirmishes. Yep, we went there. 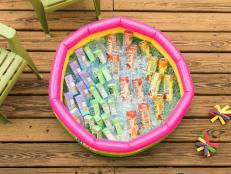 What else would you serve at a dog shower but hot dogs? 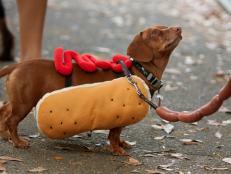 These aren't your average hot dogs, though. 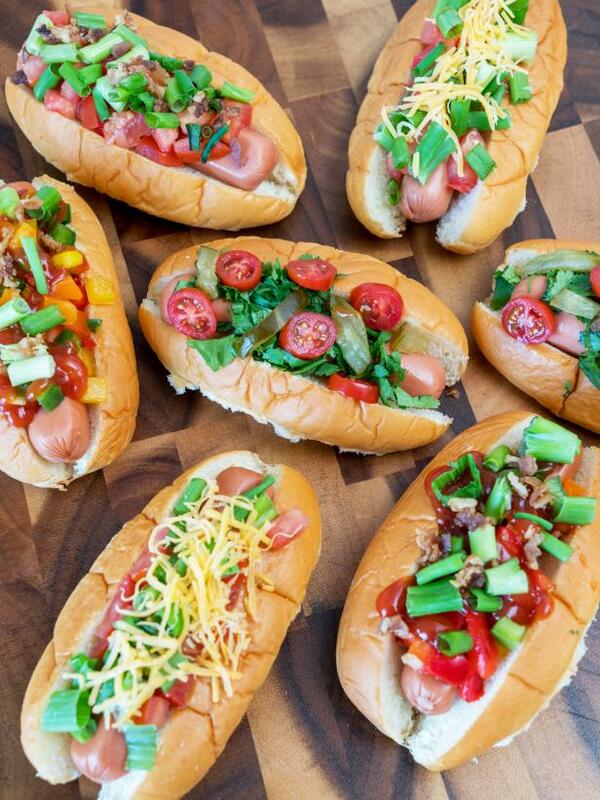 They're grown-up hot dogs. 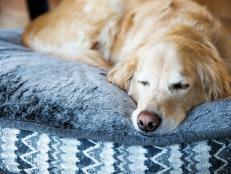 Use a variety of toppings to dress your dogs, like cheese, veggies, chili and relish. 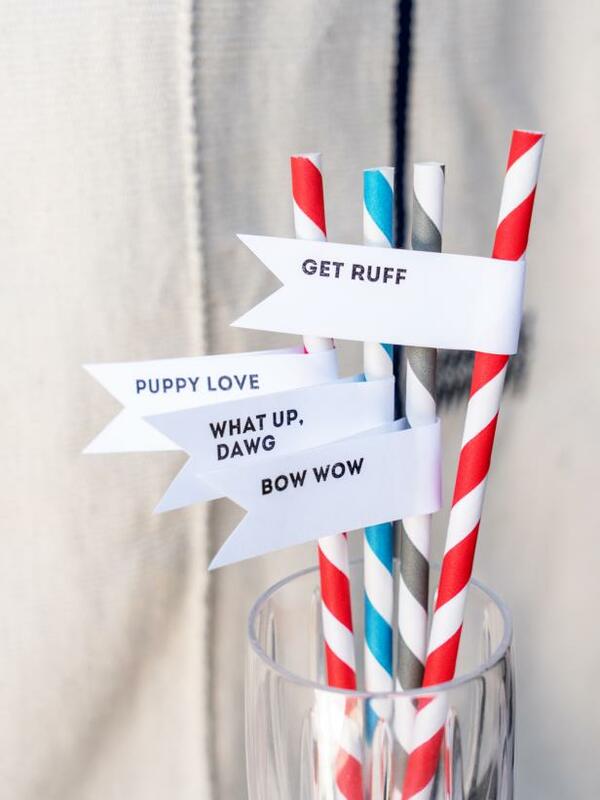 Use some colorful paper straws in your guests' drinks, and make them stand out with cheeky paper banners. Run adhesive flags through your printer and come up with your own catchy phrases, like "What Up, Dawg?" or "Puppy Love." 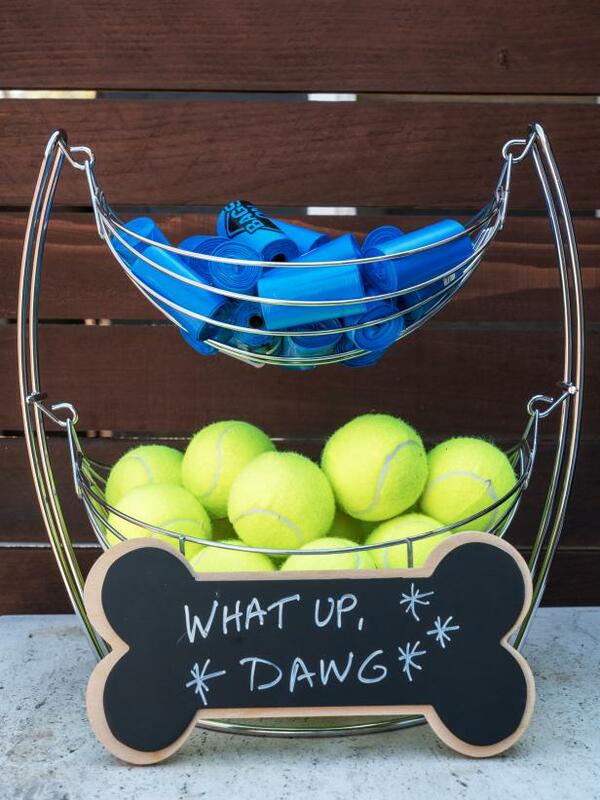 You could even personalize them with captions like "Oliver's Mom" to shout out your guests' pooches. 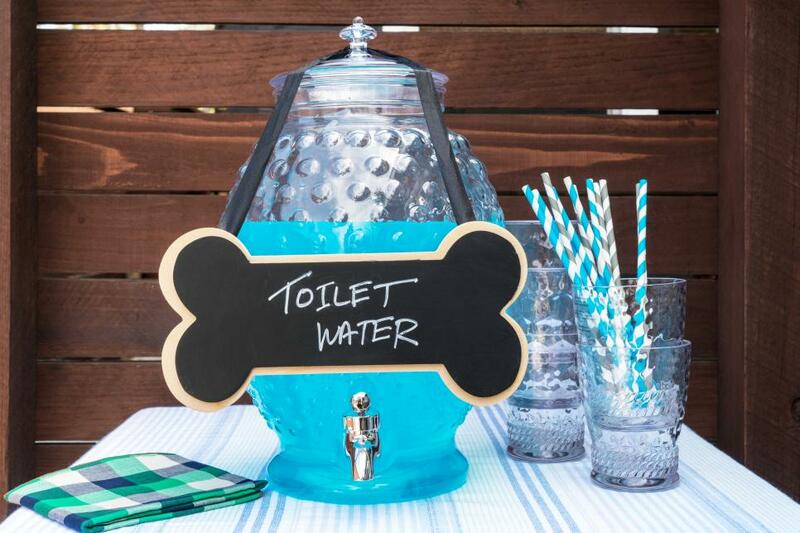 You can go full-on cheeky with a fun "pawty" cocktail like toilet water spritzers — an homage to pups that keep trying to drink out of the toilet. 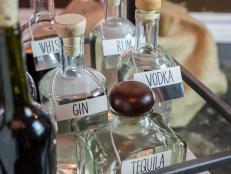 To make this concoction yourself, add white wine and seltzer to a blue beverage (like Gatorade) to mimic the look of toilet bowl cleaner. 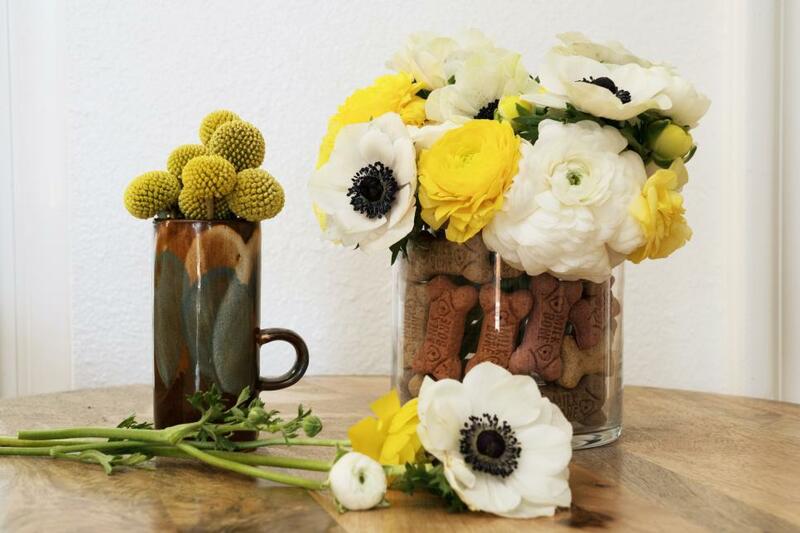 Put together some pet-friendly flower arrangements to use around your party space. 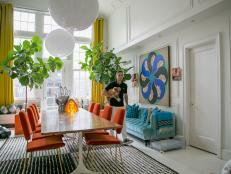 To get the look, find a round vase and place a smaller glass in the middle. You can then arrange the dog treats in the space between the glass and the edge of the vase. Then, fill the glass with water and build your arrangement. 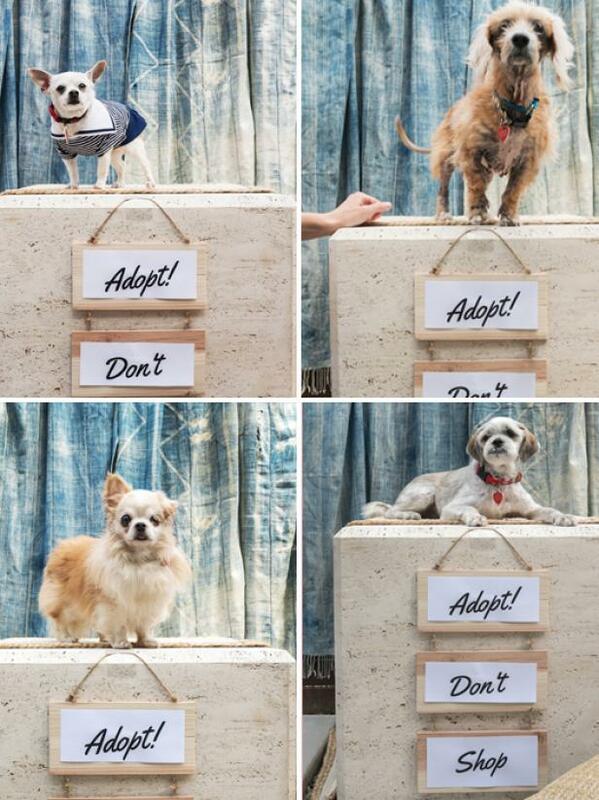 We created a photo booth to give each of the rescue pups their moment to shine. Getting them to sit still wasn't easy, but if you anticipate that you will need to snap a bunch of photos of each pup, you can just have fun with it. Meet a few of A Purposeful Rescue's adoptable pups: Winston, aka Sir Grilled Cheese (bottom right), is the sweetest 10-year-old you'll ever meet. He was immediately mugging for the camera. Stanley Roper (bottom left) had a rough time before he got to A Purposeful Rescue, living alone with other animals in an abandoned home. 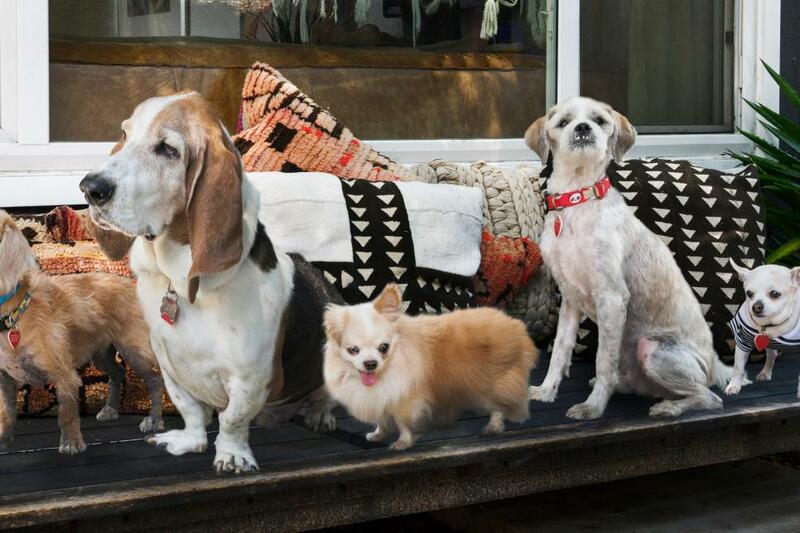 Cosita (top left) is another 10-year-old senior gal who just wants to find her forever family. And Magda (top right) is one of APR's forever fosters. 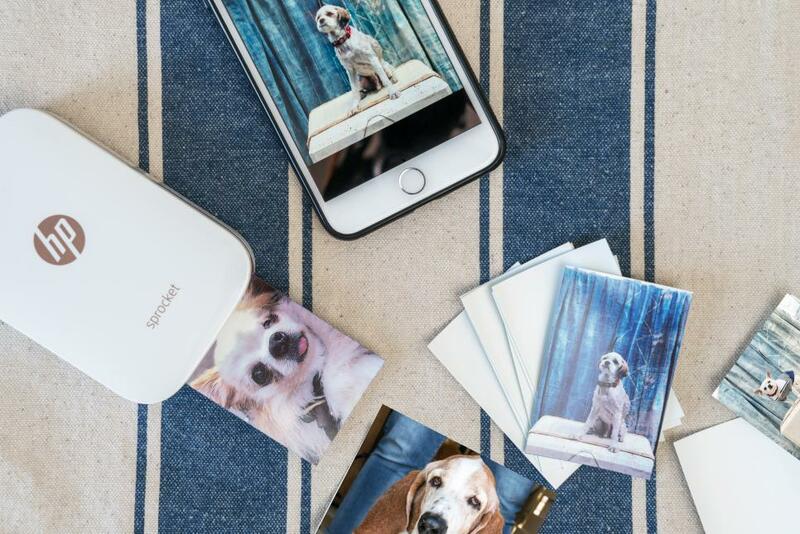 After you snap the pup portraits, print them at the party on a portable printer like the HP Sprocket. This printer is so tiny, it practically fits in the palm of your hand. It wirelessly syncs with your phone and can print photos anywhere and everywhere. Best of all, the prints are stickers! The day of your rescue shower is the perfect time to use all the silly dog references you can. This is why you definitely need to serve pupcakes. We topped our pupcakes with adorable Scottie shortbread cookies. 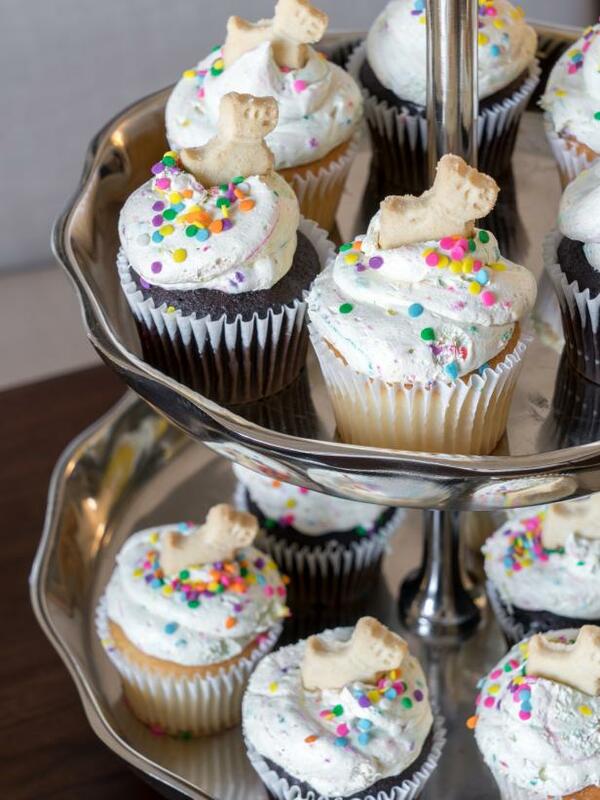 You could also make homemade cookies and use a dog bone-shaped cookie cutter for your pupcake topper, instead. 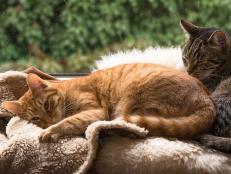 Send your guests home with a favor to thank them for celebrating the adoption your new furbaby. 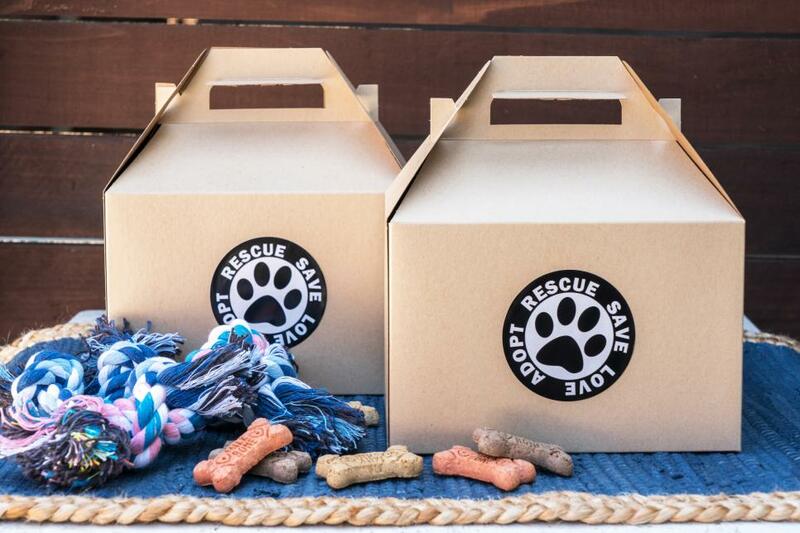 We used brown gift boxes and filled them with dog treats and toys. Helping other homeless pets is the best part of a dog shower. 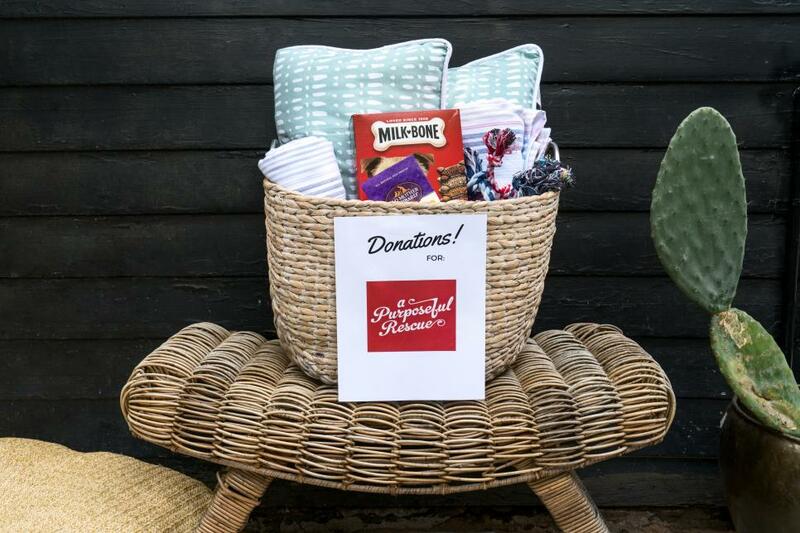 Use an empty basket to collect donations for the rescue organization you're supporting. 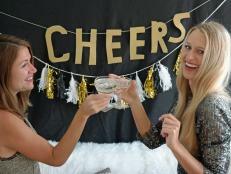 Before our party, we shared A Purposeful Rescue's Amazon Wish List with everyone invited. 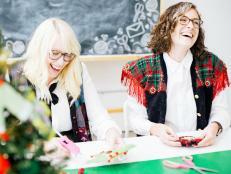 This is a great way to give back to a rescue group, even if you can't make a big donation. Simply go online, order an item on their list and ship it straight to the organization. Pro Tip: You can continue to support your rescue group by setting up an AmazonSmile profile. This means that a portion of every item you buy on Amazon will go to the charitable organization of your choice.